Posted on April 16, 2019 at 3:39 am. 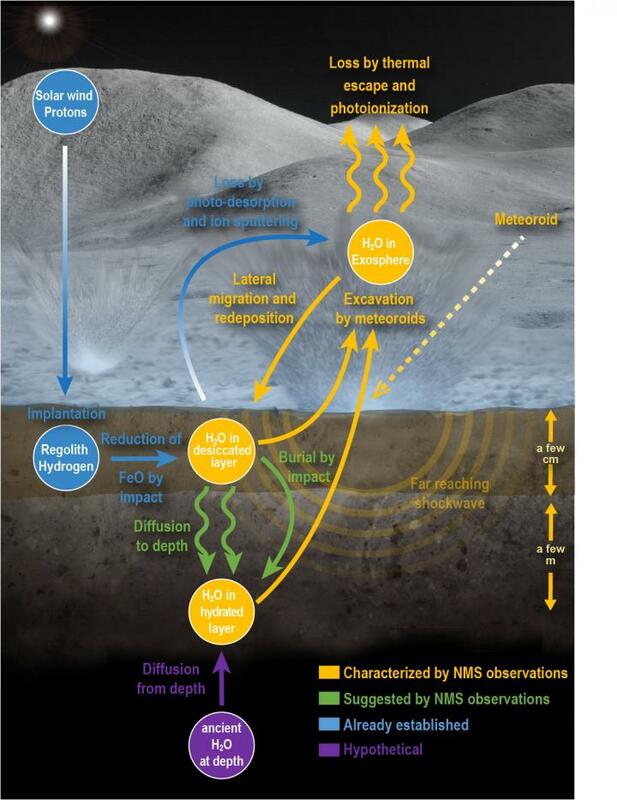 The findings will help scientists understand the history of lunar water – a potential resource for sustaining long term operations on the Moon and human exploration of deep space. Models had predicted that meteoroid impacts could release water from the Moon as a vapor, but scientists hadn’t yet observed the phenomenon. Now, the team has found dozens of these events in data collected by NASA’s Lunar Atmosphere and Dust Environment Explorer. LADEE was a robotic mission that orbited the Moon to gather detailed information about the structure and composition of the thin lunar atmosphere, and determine whether dust is lofted into the lunar sky. “We traced most of these events to known meteoroid streams, but the really surprising part is that we also found evidence of four meteoroid streams that were previously undiscovered,” said Mehdi Benna of NASA’s Goddard Space Flight Center in Greenbelt, Maryland, and the University of Maryland Baltimore County. Benna is the lead author of the study, published in Nature Geosciences. There’s evidence that the Moon has water (H2O) and hydroxyl (OH), a more reactive relative of H2O. But debates continue about the origins of the water, whether it is widely distributed and how much might be present. LADEE, which was built and managed by NASA’s Ames Research Center in California’s Silicon Valley, detected the vapor using its Neutral Mass Spectrometer, an instrument built by Goddard. Lunar scientists often use the term “water” to refer to both H2O and OH. Figuring out how much H2O and how much OH are present is something future Moon missions might address. To release water, the meteoroids had to penetrate at least 3 inches (8 centimeters) below the surface. Underneath this bone-dry top layer lies a thin transition layer, then a hydrated layer, where water molecules likely stick to bits of soil and rock, called regolith. From the measurements of water in the exosphere, the researchers calculated that the hydrated layer has a water concentration of about 200 to 500 parts per million, or about 0.02 to 0.05 percent by weight. This concentration is much drier than the driest terrestrial soil, and is consistent with earlier studies. It is so dry that one would need to process more than a metric ton of regolith in order to collect 16 ounces of water. Because the material on the lunar surface is fluffy, even a meteoroid that’s a fraction of an inch (5 millimeters) across can penetrate far enough to release a puff of vapor. With each impact, a small shock wave fans out and ejects water from the surrounding area. When a stream of meteoroids rains down on the lunar surface, the liberated water will enter the exosphere and spread through it. About two-thirds of that vapor escapes into space, but about one-third lands back on the surface of the Moon. These findings could help explain the deposits of ice in cold traps in the dark reaches of craters near the poles. Most of the known water on the Moon is located in cold traps, where temperatures are so low that water vapor and other volatiles that encounter the surface will remain stable for a very long time, perhaps up to several billion years. Meteoroid strikes can transport water both into and out of cold traps. “We know that some of the water must be coming from the Moon, because the mass of water being released is greater than the water mass within the meteoroids coming in,” said the second author of the paper, Dana Hurley of the Johns Hopkins University Applied Physics Laboratory. The analysis indicates that meteoroid impacts release water faster than it can be produced from reactions that occur when the solar wind hits the lunar surface. “The water being lost is likely ancient, either dating back to the formation of the Moon or deposited early in its history,” said Benna. LADEE was launched in September 2013 and orbited the moon from October 2013 to April 2014. The robotic mission orbited the moon and gathered detailed information about the lunar atmosphere, or more correctly, the “exosphere” – a faint envelope of gases around the Moon. After an extended mission, the spacecraft’s orbit naturally decayed and was intentionally sent into the lunar surface, impacting the moon on April 17, 2014. Ames was responsible for the LADEE spacecraft design, development, testing and mission operations, in addition to managing the overall mission. LADEE carried the Lunar Dust Experiment (LDEX), designed and built at the Laboratory for Atmospheric and Space Physics in Boulder, Colorado.